LINCOLN PARK — Looking back, the rise and fall of the King Onye jewelry shop in Lincoln Park was all very abrupt, the store's owner says now. Twenty-four-year-old Oneka Ijeoma quit her retail job, began selling handmade jewelry in front of a Pilsen coffee shop and within six months she had her own boutique on Lincoln Park's Armitage Avenue. But three months after opening up her King Onye storefront, which is inspired by her Nigerian heritage, Ijeoma couldn't make ends meet and was forced to close. "I believe in the progressive way of looking at things," she said. "I started out doing a pop-up store for a weekend and then extended it to a week and then month to month." She thought the next step would be that permanent location. The soft-spoken former activist says she isn't ready to lay down, or even move to another less pricey location, and vows to be back in business by the fall. Ijeoma's jewelry focuses on giving luxury to everyone, and some pieces play on Chicago's violence such as necklaces made from bullet casings with tree branches sprouting out. "I feel like if I were to move my store over to Pilsen or somewhere else because it's cheaper it wouldn’t be as interesting," she said. "I think a lot of times people from other communities they don’t go into other communities." Her former retail space at 707 W. Armitage Ave., which she hopes to reopen, was set among a block of like-minded young women who all either own or run their boutiques. For Ijeoma it was the perfect fit. Selling bullet-based jewelry in Lincoln Park melded two worlds into the overall theme of her brand, street regal, as she describes it. "I love the idea of having a store in which everyone who walks in feels like royalty," she said. "I believe that everyone is royalty in some way and that everybody has the ability to be king of something." 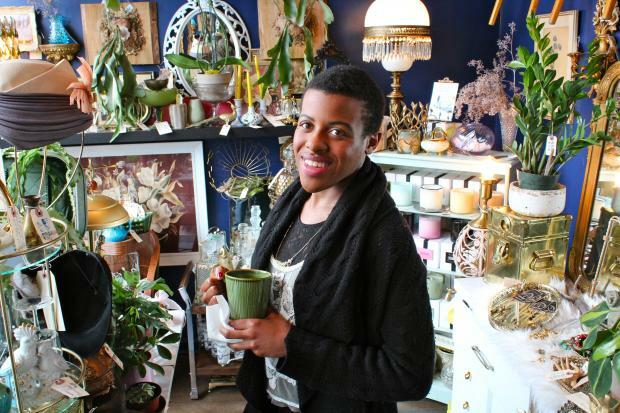 Ijeoma set up a display of a few items for sale in Rara Avis Boutique over the Mother's Day weekend, right next to her old storefront, and plans on holding trunk shows across the country over the summer to build up enough funds to re-lease her space. It's not only the beauty of Lincoln Park that draws her to that block, but the inspiration from a line of boutiques that have all opened within the past year just east of the main drag of Armitage's shopping district. While Ijeoma fights to regain her space among the young women on the block, Rara Avis's owner, Molly McCarthy, has reached out and lent her space to sell a few pieces of jewelry. It's a bond built on similar backgrounds. Ijeoma is from Texas. McCarthy is from a farm in Iowa. Ijeoma worked at the Rugby clothing store in Lincoln Park. McCarthy spent seven years working retail at Francesca's Collections in Lincoln Park. They, along with a few other boutiques on the 700 block of West Armitage, have begun calling themselves East End Armitage. "We are all 20-something cute girls who are motivated," said McCarthy, who opened Rara Avis in September. The girls on the other side of the former King Onye at Comfort Me Boutique were the first to start the trend. "It was kind of like boom, boom, boom," McCarthy said. "Comfort Me opened, then [Rara Avis] then [King Onye]." It was a "girl power thing," according to Ijeoma. McCarthy has wanted to open up Rara Avis "since birth." "I just decided I was going to do it one day in July," McCarthy said. McCarthy found all of the items on display at her tiny storefront at estate sales. She goes to them two or three days a week. Alyssa and Bethany Thomas are in their 20s and run Comfort Me, 701 W. Armitage Ave. They have been organizing events such as fashion shows to harness that girl power and bolster business on the block. "It's disappointing that [Ijeoma] left," Alyssa Thomas said. "Now there's another vacancy on the block. She was really complementary." Less than two weeks after closing up King Onye and seeing her painted logo scraped off the glass, Ijeoma launched a drive to obtain a $5,000 loan through a person-to-person lending platform called Kiva Zip. Because she is weighed down by students loans, she has no other way of obtaining a new loan to secure the lease on her storefront and pay for city licensing and other fees. "My calling in life is to make other people feel beautiful," she said. "My goal is to have a chance to fail or succeed."